Public relations professional as ethical guardian: The measures of business are no longer purely efficiency and profit where all’s fair in love and war – as long as your owners get their dividends. Today, all stakeholders count. And public relations professionals are best placed to act as their organisation’s ethical guardians. Our world is complex, dynamic and hyper-connected. Public relations professionals have the ability to act as trusted advisors to company leaders offering advice on how to cope with the growing amount of accountability faced by companies from social-media-empowered stakeholders. To cope and prosper, public relations professionals should help leaders articulate what the company stands for and how it can live up to what it says it is. In other words, public relations professionals should play a major part in developing the organisation’s corporate values and ethics from which positive action is driven. In an age of irrepressible speed and uncertainty, companies will struggle to operate through a command and control culture. Rules-based compliance should give way to values-based leadership. Companies should be helped away from being prescriptive in their rules of behaviour to becoming descriptive in how they position themselves and seek to influence the way they would like others to think, feel and act. Values help form organisational culture and, when effectively shared, they help form a common sense of identity and responsibility. It is, of course, people who make decisions and people who undertake actions. This places public relations professionals right in the thick of managing change – changing behaviours, feelings and actions of not just employees but all stakeholders. Public relations professionals do this by listening to all the conversations held inside and outside ‘the rope’ thrown around the company. By gathering relevant information upon which to make decisions. And then by helping decision makers act on this. It’s the essence of the public relations profession – after all, you can’t hope to maintain goodwill and mutual understanding with your publics without first hearing and understanding all the conversations being held about your company. This is a business fundamental – not a ‘nice-to-have’. Enduring relationships with stakeholders are the basis of long-term sustainability for the company. PR ETHICS: Does it pass the smell test? As trusted advisors public relations professionals need to exude clearly defined and well-articulated personal values. They need to be resilient. To be able to stand up to any senior manager, including the CEO, and explain, where necessary, that the intended action won’t pass the smell test. That you’re not doing the right thing. This requires moral courage built from owning a strong sense of what’s right and wrong. By the smell test I mean: does the organisation’s intended actions fit with its declared values? If not the action will create a legitimacy gap between what the company says it holds dear and how it actually behaves. In short: it ain’t walking the talk. The role of trusted advisor is an important one. 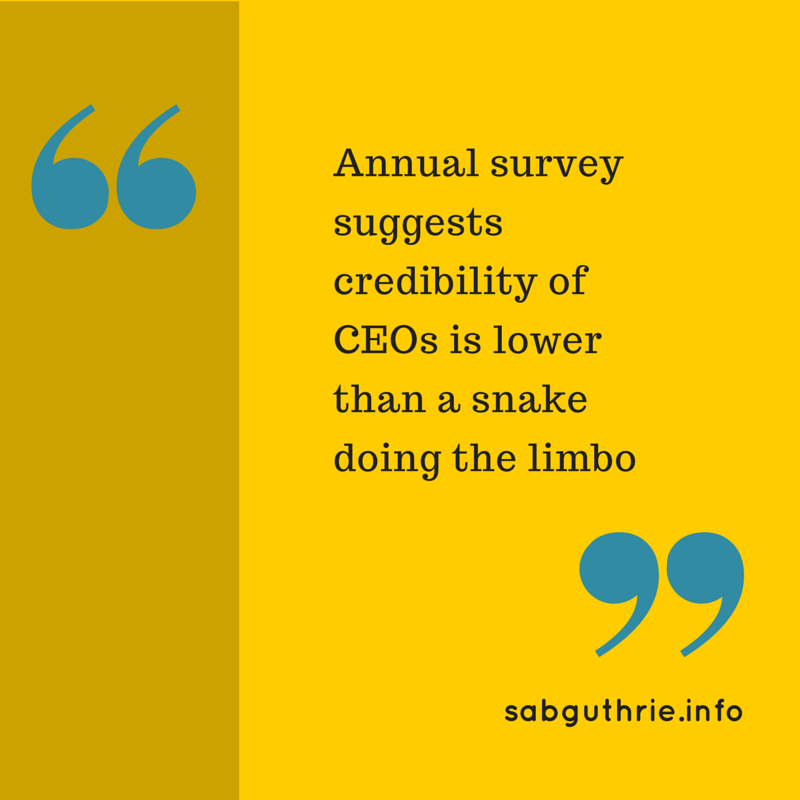 Edelman’s annual Global Trust Barometer regularly finds CEO credibility to be lower than a snake doing the limbo. It is these leaders who create and maintain the organisation’s values. It is the public relations professional who should help nurture the values and ethics and ensure the company lives by them. Building the organisational character from within. Positioning themselves as the organisation’s ethical guardians. Previous Post 4 tips all change sponsors need to know Next Post The Press don’t know what public relations is. Who should tell them?